John Henry "Doc" Holliday started out as a well-known dentist in Georgia, but some bad news changed the direction of his life forever. He ended up becoming a notorious gambler and violent outlaw of the Midwest. To discover more about Holliday and why he turned his back on his noble career to start a life of gambling and crime, please feel free to read through this entire biography. You are bound to learn something you never knew before. John Henry Holliday was born in Griffin, Georgia, on August 14th, 1851, to an upper-middle-class family. His father was a pharmacist, and his mother was a southern belle who was known for her hospitality. Holliday suffered from a cleft palate and had to undergo corrective surgery when he was just an infant. He had a noticeable speech impediment when he began to talk, so his mother spent a couple hours with him each day to improve it. Thanks to her persistence, by the time he entered kindergarten, his impediment was completely gone. When Holliday was just 10 years old, his father left to serve as a major in the Civil War. While he was away, his mother was diagnosed with tuberculosis, causing her to have a persistent cough and an extreme loss of appetite. She died just a few months after being diagnosed, which was very hard for young Holliday to deal with. Luckily, the Civil War ended soon after she passed, and his father was able to come home and help him through that difficult time. After he graduated from high school, Holliday was eager to further his education. He looked into several different schools before settling on the Pennsylvania College of Dental Surgery in Philadelphia, PA. That school had an excellent program that allowed its students to move at their own pace. Holliday was able to finish the program in a little over 2 years, which was quicker than any student before him. After graduating from the program and passing his tests to become a certified dentist, he moved back to Georgia to start his own private practice out there. He picked up new clients quickly and was really enjoying his new trade. Things took a turn for the worst, though, when Holliday was diagnosed with a mild case of tuberculosis. He would not let this new diagnosis get him down; he was determined to make the most out of the time he had left. He moved to Dallas, Texas, in hope that the warmer climate and drier air would improve his condition. While out there, he teamed up with John Seeger to start a very successful dentistry practice. As the years went on, Holliday's tuberculosis got increasingly worse. His constant coughing was starting to interfere with his work; clients were hesitant to have him come close to them, as they thought he might be contagious. At first, he cut back his hours to part-time, but he eventually had to give up his practice altogether. Now that Holliday had a lot of time on his hands, he started spending his afternoons at the nearby saloons. This is where he first learned how to play poker. He spent several months honing his skills and playing against the regulars at the saloon. He quickly became unstoppable; no one in Dallas could beat him. So, what did Holliday do? He started traveling from state to state, playing poker against people from all over the country. While on the road, he became known for his temper and his willingness to solve his problems through violence. His weapons of choice were often his Colt Army revolver and his 9-inch-long, double-edged knife. While passing through Tombstone, Arizona, he met a man named Wyatt Earp. Earp was a good poker player who gave Holliday a run for his money. In the middle of one of their playing sessions, they were interrupted by a group of outcasts that were claiming Earp owed them thousands of dollars. Holliday abruptly pointed a gun at their leader's head and forced them to flee town; Earp was thankful that Holliday was there to save his life. Sometime later, the group of outlaws returned, this time threatening to kill both Holliday and the Earl family. What started out as a heated argument quickly turned into a nasty blood bath. This 30-second gunfight, known as the Gunfight at the O.K. Corral, would go down in history as one of the most gruesome gunfights of all time. 30 shots were fired in 30 seconds, and several people on both sides lost their lives. Holliday would eventually find himself in Fort Griffin, Texas. He played poker against a man named Ed Bailey, who was notorious for cheating. Despite seeing Bailey look through the discard pile on several different occasions, a highly illegal move, Holliday was still able to beat him through a series of great bluffs. One bluff in particular caused the entire table competing against him to fold. Unwilling to show his cards, Bailey became furious. He pulled a gun on Holliday, who didn't hesitate to slit his throat. Holliday was not a man you wanted to mess with. Two gamblers from Colorado questioned whether or not one of his poker moves was legal. He shot them both point-blank just because he didn't like the manner in which they were speaking to him. Holliday supposedly killed hundreds of people during his lifetime, including Mike Gordon, Johnny Ringo, and Charley White, to name a few. There have been lots of rumors centered on Doc Holliday and his lover Big Nose Kate. Born as Mary Katherine Horony, Big Nose Kate spent the first part of her life as a prostitute in Hungary. She eventually broke free from that lifestyle and headed to the United States in the hope of a better life. She first met Holliday at John Shanssey's Saloon in Fort Griffin, Texas, where she was working as a dance hall girl. 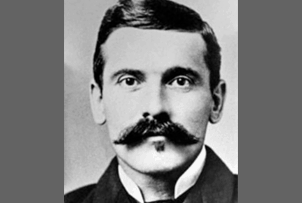 Doc Holliday and Big Nose Kate had an instant connection, as they were both very passionate, ill-tempered people. Once they met, they were practically inseparable, traveling all over the Midwest together. Big Nose Kate would often be found cheering Doc Holliday on as he played poker at the saloons of whatever town they happened to be passing through. Big Nose Kate was known to always have Doc Holliday's back, allegedly breaking him out of prison on more than one occasion. She would often confront the officers holding him prisoner, flirting with them until they agreed to let him go. If that didn't work, she would pull out one of her many pistols and fire away. Big Nose Kate supposedly killed almost as many people as Doc Holliday did. Of course, Holliday and Big Nose Kate didn't always get along. After one nasty fight, Holliday kicked her out of his hotel room and told her to find a new place to stay. As a way to get revenge, Big Nose Kate signed an affidavit claiming that Holliday had robbed a stagecoach that was headed towards Benson, Arizona, taking $26,000 in silver bullion. Holliday refuted her claims, and although he was furious, he did eventually forgive her. When Holliday's health was at its all-time worst, he heard that the Santa Fe Railroad was expanding their tracks to Las Vegas, New Mexico. Realizing that his life would be coming to an end soon, Holliday wanted to do something memorable. He paid a carpenter $372.50 to build a saloon along the tracks in his honor. Holliday passed away on November 8, 1887, while staying at The Hotel Glenwood in Colorado Springs, California. Big Nose Kate was there when he breathed his last breath, making arrangements for his funeral service soon after he passed away. Holliday's headstone can be found in Linwood Cemetery just a few miles away from the hotel, but his body was allegedly buried in his hometown of Griffin, Georgia. Holliday may have passed away, but his legacy lives on. Every year, the town of Griffin, Georgia, hosts a BBQ and musical festival in remembrance of his life. He has also inspired numerous novels, including O.K. Corral by Eric Adam and Xavier Fauche (1997), The Fourth Horseman by Randy Lee Eickhoff (1998), Territory by Emma Bull (2007), and Southern Son: The Saga of Doc Holliday by Victoria Wilcox (2013). Well-known films that reference him and his antics include Frontier Marshall (1939), Gunfight at the O.K. Corral (1957), Tombstone (1993), and The American West (2016).